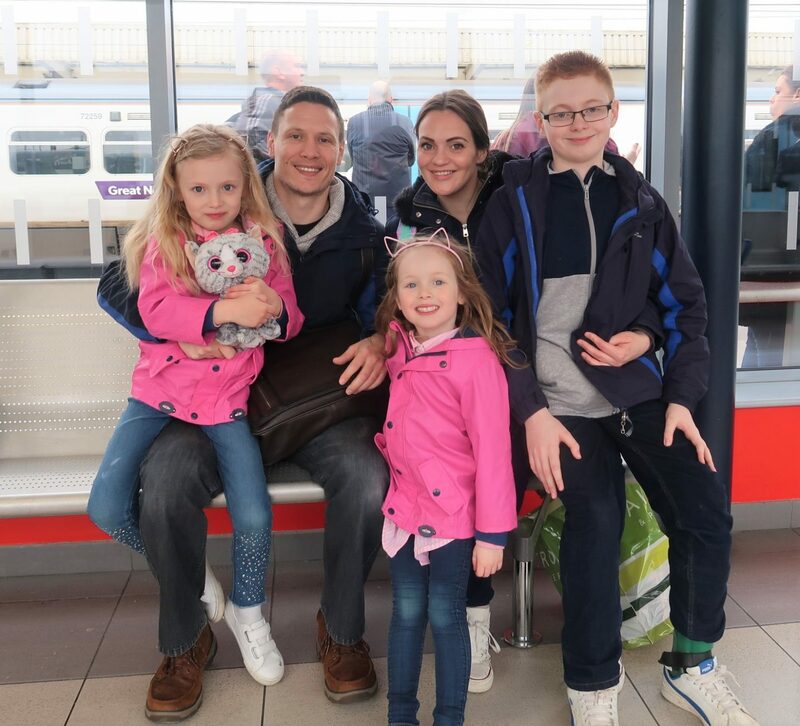 We have just returned from a fun family day out in London visiting Kidzania for the first time and as it happens, it was also the first trip to London with all five of us. 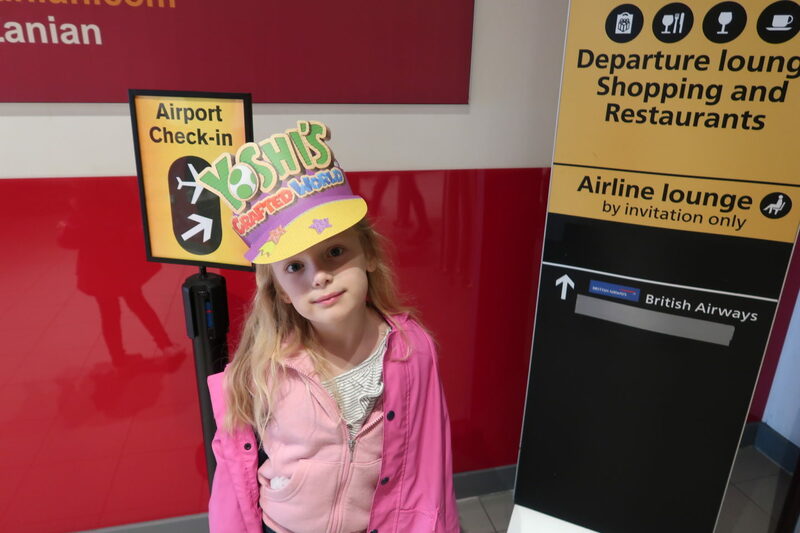 To celebrate the launch of Yoshi’s Crafted World on the Nintendo Switch, we were invited to come to Kidzania for the day to take part in the exclusive Easter egg hunt featuring the beloved character and have a play on the newly released game which we all enjoyed very much, especially Leo who is Nintendo mad. 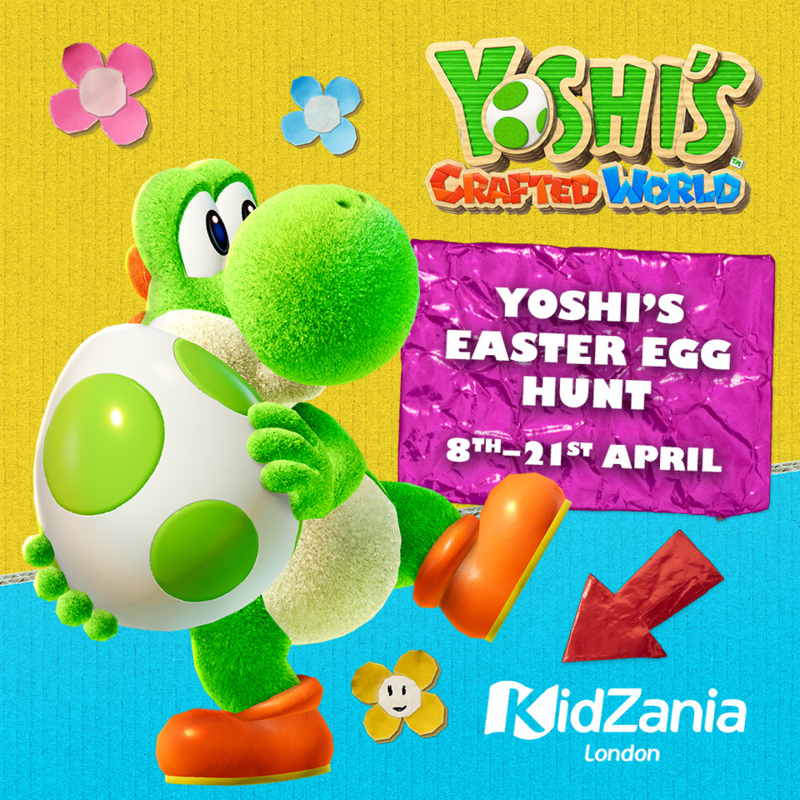 Anyone visiting Kidzania during Easter holidays can take part in Yoshi’s Easter fun, which is running until Sunday the 21st April 2019. As we approached the top of the escalator the first thing the kids saw was the front of a giant aeroplane and as we got to the top we could see Kidzania and a queue of people waiting to get inside. We were there on a press event so we went straight over to join the queue, otherwise, you would need to go to the desk opposite to the entrance to pick up/purchase your boarding passes (tickets). As you go through the entrance, it is set up to look like an airport with gate signs and escalators replicating a real airport showing you where to go to check in. Once you have gone all the way to the top of the escalators you will reach check-in which looks like you are actually at an airport. When it was our turn we handed over our boarding passes, which then got ripped just like a normal boarding pass would and handed back. The lady behind the desk asked the children how old they were before putting on a security tag on our wrists including us adults. 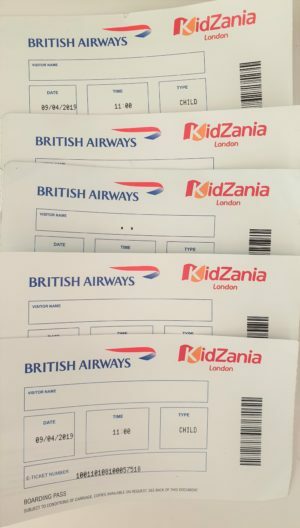 This was so they couldn’t leave Kidzania without an adult if they had got lost and also to check them in and out of jobs, which I will get to shortly. The kids were given a hairnet to look after in case they did any cooking and 50 Kidzo’s to get them started on their day. 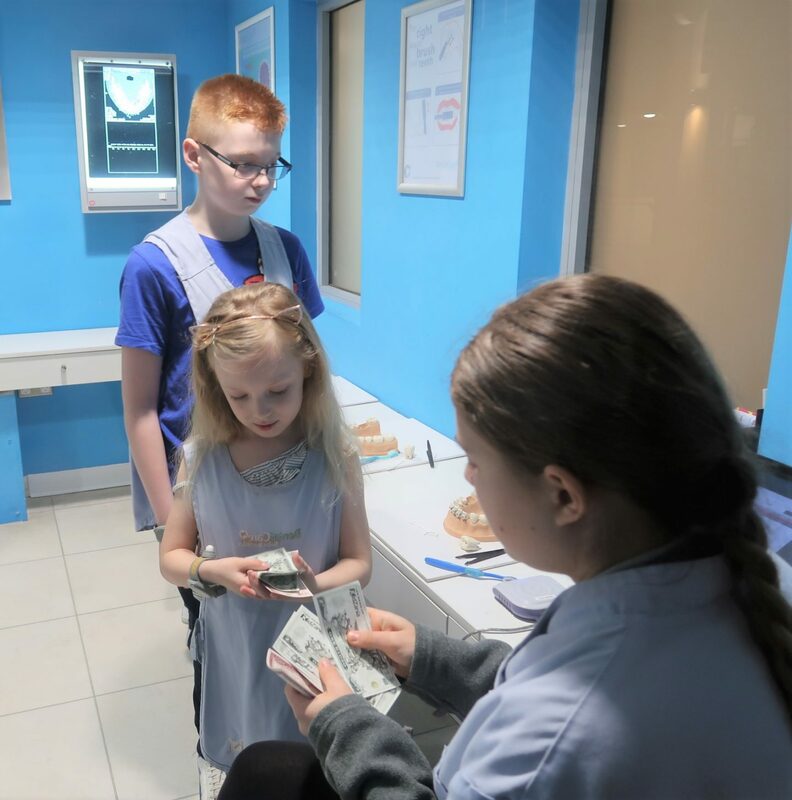 Kidzo’s are Kidzania’s currency so when they have completed a job, they get paid in Kidzo’s. 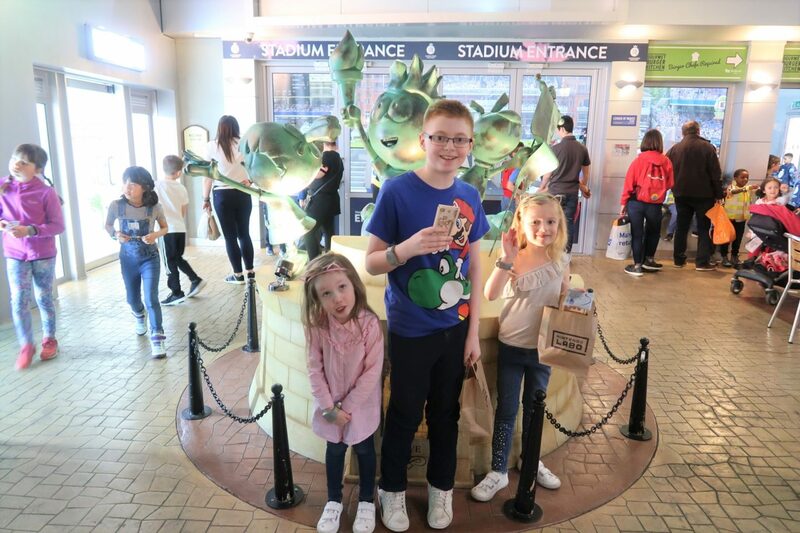 Once we had finished checking in, we headed straight over to the Nintendo switch event where Leo, Lydia and Emily got to play on Nintendo’s new game ‘Yoshi’s Crafted World’ for a short while before heading off on an Easter egg hunt around the city. They were each given an activity book and inside there were seven clues on where to find the letters they needed to complete the hunt and win a prize. The clues were easy enough for the children to work out on their own with no adult help and it was lovely to see them take the lead. 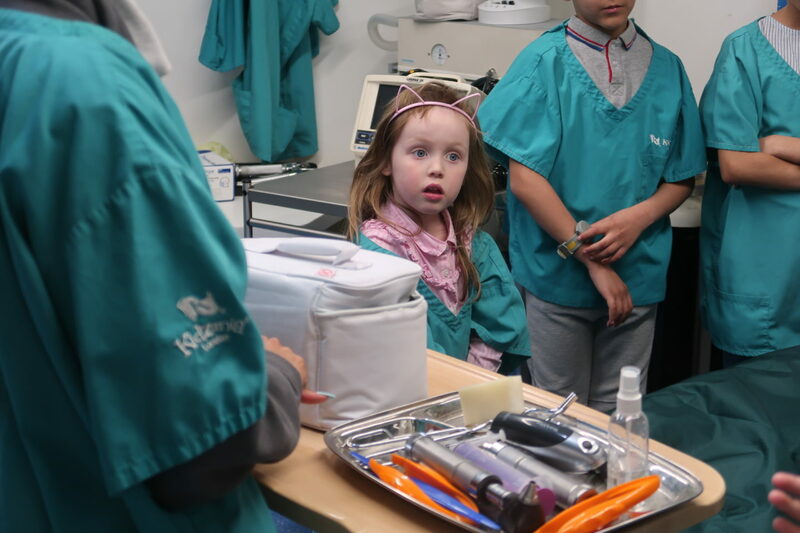 After we had completed the Egg hunt we went to explore more of Kidzania, but first I needed to offload the five coats I was now carrying with me. We saw a storage locker place that costs £3.50 and was big enough to fit two backpacks and five coats inside. You don’t get a refund upon returning the key, but it was a small price to pay to have my arms free to take photo’s and not have to worry about carrying luggage. 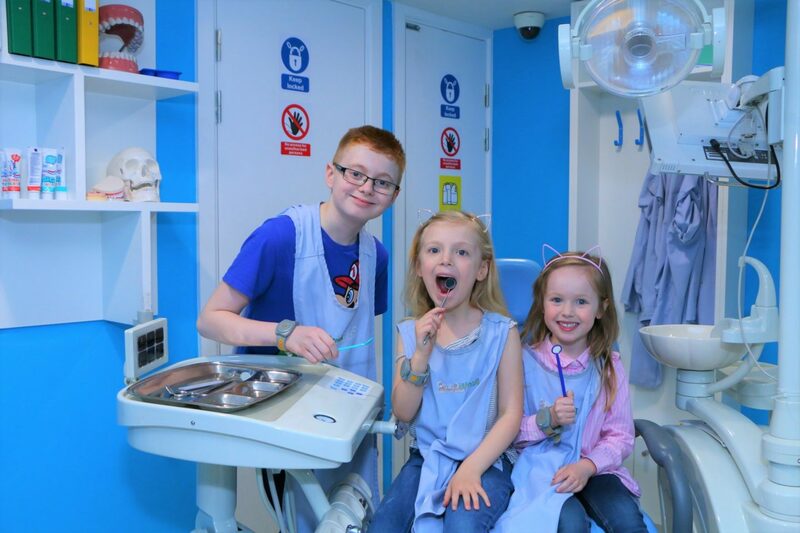 Their first job was to be a Dentist, as there was no queue at the time for this one, so I thought it would be a good starting point. When it is their turn to go in they have to be checked in and out and they do this by scanning their security tags. This was so they knew the age of the children and where the children were. For this particular job, they were inside for fifteen minutes and there is a member of staff inside each workplace to give instructions and create a structure to what they are doing and then at the end, as they are checked out, they get paid in Kidzo’s which really impressed Lydia and Emily. 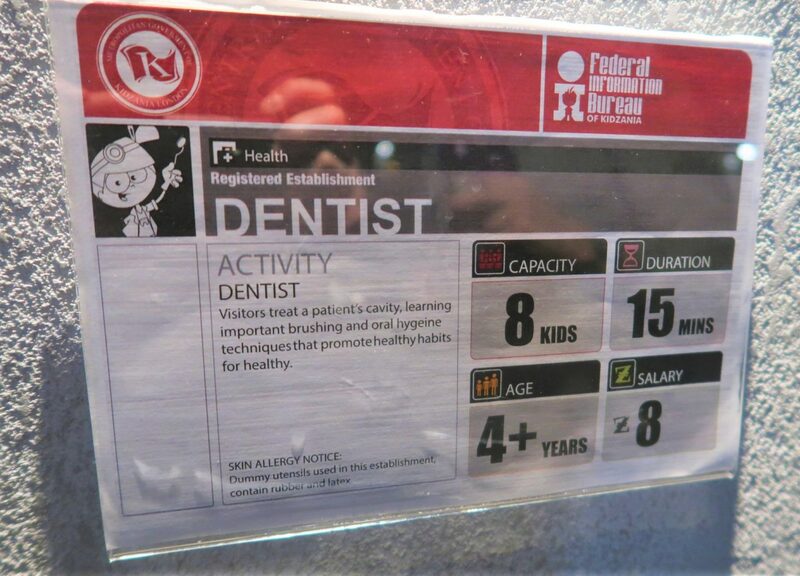 Each job has an information board at the entrance stating how many kids can go in at one time, the duration of the job, a minimum age limit and a salary of how many Kidzo’s they would earn in the duration of the job. 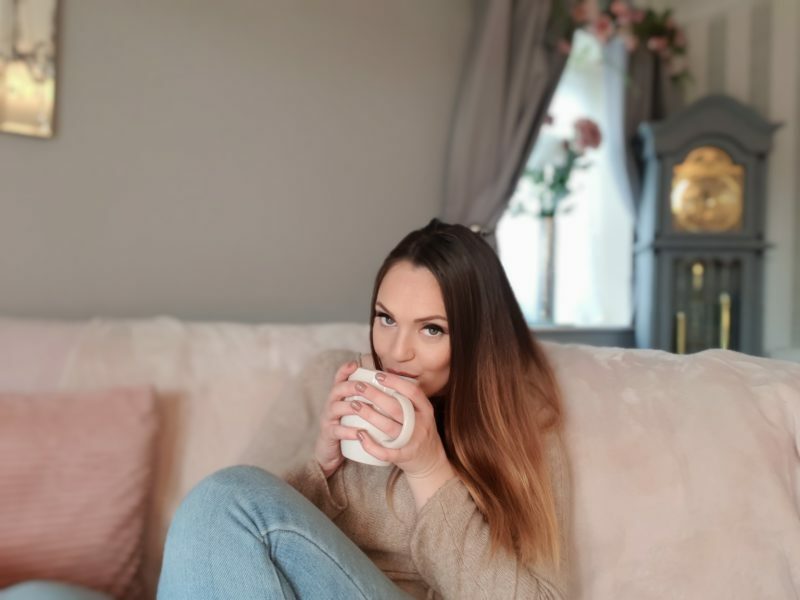 Only kids are allowed inside the workplace and the adults have to wait outside, but there are tables and chairs scattered around so you can sit and watch them/wait for them whilst enjoying a cup of tea. You can also bring in your own drinks and snacks if you wanted to save some money. As a parent, I would recommend wearing comfortable shoes and bringing something with you to help pass the time, as you will be waiting around for them – a lot. Our next stop was food, so we headed over to the Gourmet Burger Kitchen where the kids could make their own burger to eat. This does cost £3 each which you have to prepay for at the till. Today, however, it was running slow. The sessions say they run for 15 minutes but for some reason, it was more 20 minutes which took a big chunk out of our day and I wish we had just brought them burgers, but they had fun so it was ok.
David and I had bought ourselves two cheeseburgers and 2 fries whilst we were waiting for them. There is a kids meal you can buy for £6.95 that comes with a burger, fries/chips and a drink. Otherwise, the main menu provides each part of the meal separately and will cost a lot more – although the portions are bigger. After lunch, Leo and Lydia wanted to go and work in the Nintendo switch Labo lab. This job came in two parts, which each took 25 minutes. In the first part, Leo and Lydia got to build and decorate an RC car for the switch and in the second part they got to play with all the Labo sets that had been already made. Lydia’s favourite was the house and Leo’s was the piano. They each earnt 8 Kidzo’s. I knew this wasn’t Milly’s thing so whilst David was staying to watch them, I took her round to be a baby care nurse, a job which had caught her eye as she could see Luvabella through the glass. Inside she got to wear a uniform and then pick a Luvabella baby from a cot. They learnt how to look after a baby; feed them, play with them, change their nappies and put them to sleep! Emily really enjoyed this job and earnt herself 6 Kidzo’s. 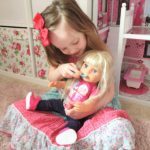 Next door she got to be a paramedic – she looked adorable in her little uniform – and in no time at all, she had carried out her first liver transplant at the grand age of 4. When I asked her what she had to do she said “I had to cut his belly skin off, pull out the brown thing and then put another brown thing and then put his belly skin back on again.” This earnt her 8 Kidzo’s. Whilst Emily and I had gone off to do these two work placements, David was still waiting for the kids at the Labo so, unfortunately, there wasn’t a lot of time left for Leo and Lydia to do anything else, as you only got a 4-hour time slot so we went for an ice cream at the shop and headed to check out. Just before we were about to make our way to the airport to check out, Lydia announced that she had left her Labo Rc back at the activity station so we went back to get it. 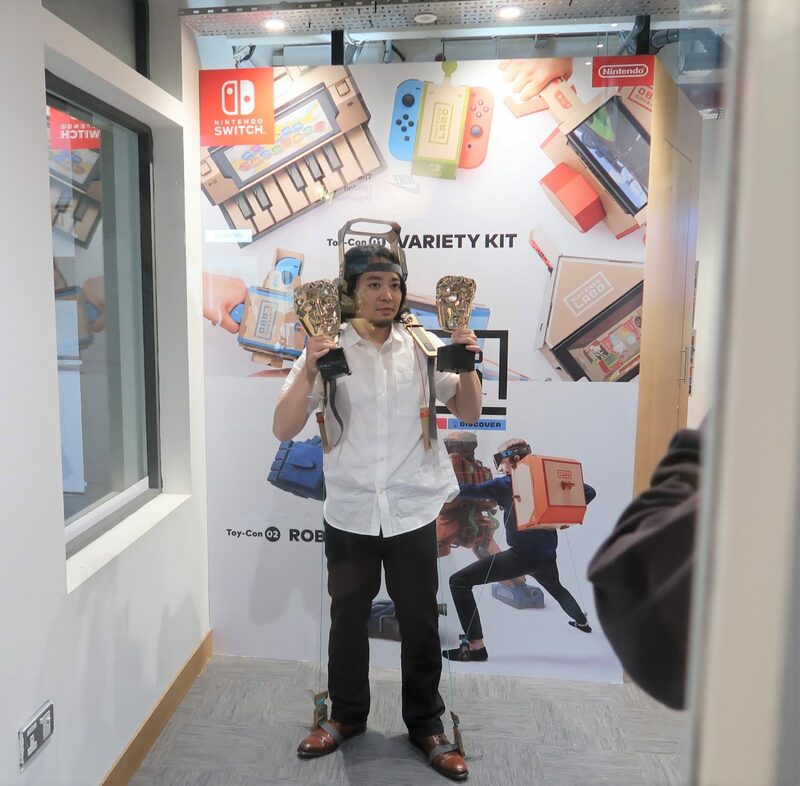 We noticed lots of press and curiosity got the better of me, turned out that it was the Nintendo Labo Director, Sakaguchi-san, with the two BAFTA games awards that Nintendo Labo just won in family and Game Innovation categories. How’s that for good timing. 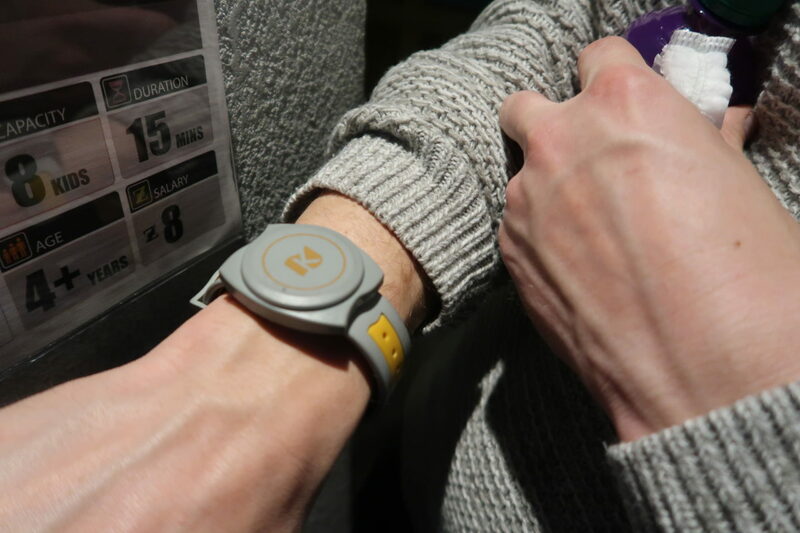 We had to go through immigration when we were leaving Kidzania and inside there was a photoshop where a member of staff scans your security bracelet and the photos of you that had been taken throughout the day appeared on the screen. 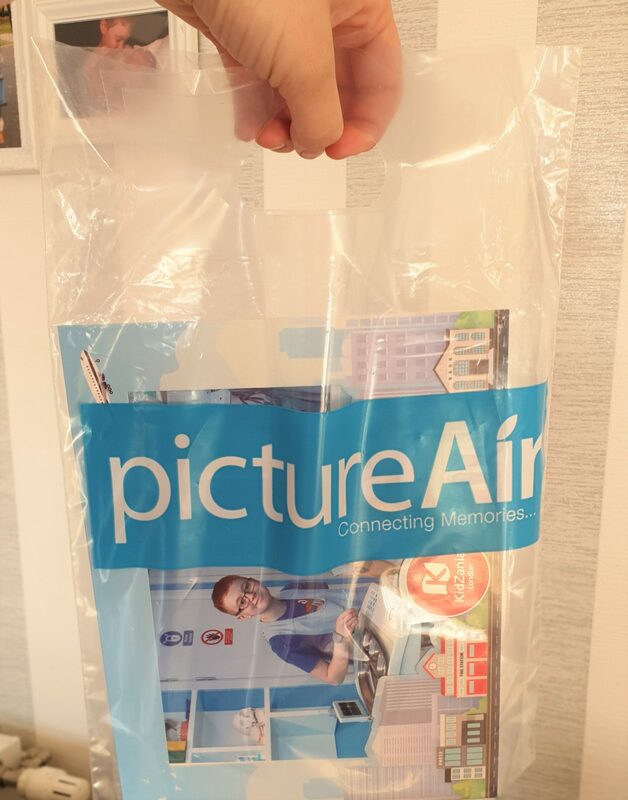 We bought a print for £12 and you get the digital copy free (the code is on one of the receipts they give you). Upon checking out, we got our bracelets scanned and removed before heading to the shop so the kids can spend the money they had earnt throughout the day. The shop wasn’t that great, unfortunately, and most of the half decent toys you could buy were over 100 Kidzo’s which I doubt you could earn during one visit alone unless the kids work tirelessly. If anything, it teaches kids to work hard to earn more. A very kind family did randomly give us 75 Kidzo’s which we put towards a princess crown for Emily that cost 110. Lydia and Leo decided to take their’s home in case we ever came back. We had a lovely day in Kidzania and we will definitely come back soon so the kids can explore some more of the city. Four hours is plenty long enough for the day but not enough to do everything. You can check out more day trip reviews by clicking here.